On January 29, a Chicago grassroots coalition of former Barack Obama fans and supporters verbally reacted to Obama's Jan. 28 State of the Union address. Obama may have fooled these folks in 2008, but he didn't fool them in 2014. Wonder if that has a few Democrats worried about November? Especially since it's not likely Obama or the social progressives in Congress are going to pull them back into the fold before Election Day. And, if the comments made in this make-shift Chicagoland round-robin by largely unemployed Chicagoans shocked you when you heard that Black Americans are not only ready to throw Obama out of the White House, some want him to resign and get out of town. On the other hand, the elite blacks—like the Dr. Cliff Huxstable (you know him as very popular, immensely successful actor Bill Cosby)—talk about the guy in the White House like he's being picked on by racist white skinheads because he's a black man (which doesn't sound like the Bill Cosby I've enjoyed for decades). 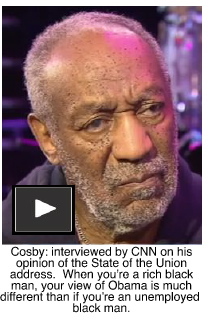 Cosby, like the rest of the social progressives in this country, think because every federal court in the nation has refused to allow common, ordinary working middle class people to present evidence that Barack Obama is a British East-African (Kenyan)-born Indonesian citizen who never was, and still is not, a United States citizen, by declaring they lack legal standing to file a lawsuit since they cannot prove they would be injured if that statement was true. In the view of the social progressive courts, only Congress has standing to file such a lawsuit—even though the Democratic leadership in Congress (Speaker Nancy Pelosi [D-CA] in the House of Representatives, and Majority Leader Harry Reid [D-NV] in the Senate) was complicit in the crime. And, it was a crime. In the communist world (which American is rapidly becoming), only government has standing to file legal actions against the government. Of course, in communist countries, the government does sue the government since the government is always right. Obama' claim to citizenship is based on a stolen birth certificate which was issued to Virginia Sunahara who was born on Aug. 4, 1961 and died a day later on August 5. Fifty years later, no one would ever have a reason to look for a stolen birth certificate which was issued to Virginia Sunahara who was born on Aug. 4, 1961 and died on August 5. Her birth/death certificate would have been issued on Aug.5, 1961. That birth certificate was the perfect candidate for Obama's use since Sunahara lived less than 24 hours. Maricopa County, Arizona Sheriff Joe Arpaio has forensically proven beyond a reasonable doubt that the birth certificate Obama purports to be his own, is a counterfeit. In addition, the Social Security card he uses as his own was officially issued to only one person by the Social Security Administration. That person was Jean Paul Ludwig who was born in 1890 and died sometime around 1970. Obama began using that Social Security number during his college years, which began with his admission to Occidental College in California as a foreign exchange student. The same thing with Obama's fake Selective Service card which Obama didn't need as long as he was a foreign exchange student since the US military cannot draft foreign residents. But when Barack Obama magically replaced Barry Soetoro at Columbia University in 1982, the newly fabricated American citizen who wanted to go to college needed a Selective Service card since the Solomon Amendment (named after Congressman Gerald Solomon [R-NY] who pushed the Military Selective Service Act through Congress in 1982) denied college eligibility to any American who had not applied for a Selective Service card by age 18 years, 6 months. In 1985, Sen. Strom Thurmond [R-SC] pushed through an amendment to that law which denied American males the right to apply for federal jobs if they did not possess a Selective Service card. So, Obama secured a Selective Service card. It, too, is fake. Why didn't Obama simply apply for one? Because to secure a legitimate Selective Service card, you also need a legitimate birth certificate and a legitimate Social Security card. 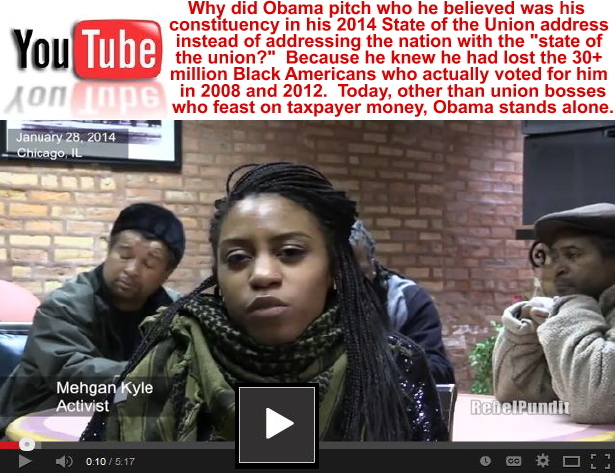 Whether or not any of the participants of the ad hoc State of Chicago group which denounced Obama's State of the Union address by presenting their own economic message knew, or even cared, that the black man in the White House who impacted the lives of all Americans cared about any American citizen. All they knew as they watched the State of the Union address on Jan. 28, was that Barack Obama was not good for them—and, what's more, he's not good for America. J.R. Fleming, the Founder of the Chicago Anti-Eviction Campaign, made the most cohesive statement of the evening. "This State of the Union," he noted, "was the same-old, same-old. A bunch of talk. A bunch of talk and rhetoric. To give faith to a dying economy in America. And the reason why our economy is dying is because the president's approach has always been to place blame on the corporate world and to place blame on the rich. The blame is equal. It's not the 1% problem. It's not a 99% problem. It is an American problem. And the problem is patronage, nepotism, and cronyism." Joe Watkins, the Founder of V.O.T.E. (Voices of the Ex-Offender) commented that Obama has been "...more hurtful to the Black race than he has been helpful. For a lot of symbolic reasons that a lot of black folks accept that —or should I say, most of those who are black who think they're better off, accept that for symbolic reasons. But those of us at the bottom of the ladder, we don't accept that." He continued by saying that "...Anytime you turn around...(and hear the politicians talk about raising the minimum wage)...for federal contract workers (you have to ask) what about the rest of us? Who don't have jobs at home? He hasn't even addressed this issue. How are you going to get jobs for us? How can they create jobs for us if they don't bring us into the market place? How can they create jobs for us if we're not at the table with them?" Mark Carter, also an activist with V.O.T.E., directed his words to Obama. "Mr. President," Carter said, "we'd probably be better off if you cut your presidency off right now. Just quit. Because if this is what you call helping us, then just stop helping us." While Sen. Harry Reid [D-NV] does not come up for re-election again until 2016, the voters of Nevada can put him on the ballot this fall by simply recalling him and making him face the voters this fall. Let him bite the bullet for his sin. Reid is the person who gutted a dead House bill, HR 3590 (the Service Members Home Mortgage Act) and amended a dead House bill to make it appear that Obamacare (which must constitutionally originate in the House, was an Affordable Care Act bill when it was a bill to provide veterans with mortgage money for a new home). Reid perjured himself to the Supreme Court by telling the justices that Obamacare originated in the House, when all of the component bills originated in the US Senate. So, if you are one of approximately 10 million people thus far who have lost their health insurance, Harry Reid, Nancy Pelosi and Barack Obama are more responsible than anyone else for making it happen. You can fire Reid and Pelosi and every Democrat in the Senate who delivered the votes to pass that atrocity. And, if you get rid of Reid through recall, and dump all 19 Democrats coming up for reelection in November, you can also get rid of Obama through impeachment in the House and removal from office by a 2/3 vote in the Senate. (Here's a tip for Nevada voters—remember the hour-long blackout in Clark County, Nevada during the midterm election in 2010? Remember who was leading when the lights went out? Sharron Angle. Remember who was leading when the lights came back on? Harry Reid. Remember who serviced the electronic voting machines that year? SEIU. Did they have a contract to service them in 2010? No, they lost it in 2008—two years before Reid "won" over Sharron Angle. Why was SEIU servicing the voting machines in 2010? When SEIU's contract expired, a majority of the commissioners did not want to renew it. Harry Reid's son, Rory Reid, was the Chairman of the Clark County Commission. Rather than put anyone else up for consideration, Rory Reid used one of those small clauses that allowed SEIU to continue to service the voting machines until a new vendor was hired. Of course, hiring a new vendor was not in the Reid playbook—and as long as Harry Reid is in the big He-Who in the State, he will control the political playbook. In 2010, the Reids were planning a double win. Harry Reid's reelection to the US Senate and Rory Reid planned to steal the gubernatorial race from former GOP US District Court Judge Brian Sandoval. Even with the blackout help of the SEIU, Sandoval prevailed against Rory Reid 53.4% to 41.6%. In addition to the bulk theft caused by thousands of nonexistent votes with no corresponding voters casting the ballots which ended up in Harry Reid's column, the Nevada electronic voting machines used the easiest sleight of hand theft technique to deliver votes to Harry Reid. Hundreds of voters complained of this problem. When the voter went into the voting booth to cast their ballot for Sharron Angle, Harry Reid's name was already marked. They had their machine cleared, then voted for Angle. What they don't realize is that they actually did vote for Reid before they revoted for Angle. One such complaint in the Election of 2010 came from Joyce Ferrara of Boulder City, CO who said when she went into the voting booth, Reid's name was already checked on the electronic ballot. The same thing happened in the voting booth next door where her husband voted for Angle, too. Several other voters at the same time in that same precinct complained the same thing happened to them. It was a common occurrence in every battleground State in 2008, 2010 and 2012. In 2010, Mark Hemingway of the Washington Examiner noted that the Obama White House political director, Patrick Gaspard was formerly SEIU's top lobbyist in Washington. And former SEIU president Andy Stern was the most frequent visitor to the White House during that election cycle. Do the math. And here are two math exercises. In 2008, 56.8% of the registered voters, or 96,992,000 registered voters voted. Surprisingly, there were 132,618,580 votes. Do the math. There were 35,726,000 more votes than voters in the ballot box. In 2012, 57.7% of the registered voters voted. Those registered voters cast 90,682,968 votes. Not at all surprising, there were 126,985,809 votes counted. Again, do the math. There were 36,302,841 too many votes in the ballot boxes. The left leveled the allegation because they do it, they believe that in elections everyone cheats. When the newly-elected Virginia Gov. Terry McAuliffe was the head of the Democratic National Committee he taught the Democrats a new dirty trick. It's called datamining. What the Democrats were theoretically doing was building a nationwide database on every Democratic voter. All of their personal information, plus what polling place they voted at in their county and State—and precisely when they historically vote. Were they an early voter, or did they vote on Election Day? The idea was they could contact the early voters and offer them rides to their polling place, and stay on them until they actually did vote. The same with the Election Day voters. Only now it was critical to stay on them since this was their last chance to get out and vote—there was no tomorrow. Smart? Yes. But McAuliffe got smarter. They datamined Republicans as well. Only, in these calls, all they did was identify those who vote on Election Day, or in 2012, planned to vote on Election Day. They had no interest in early voting. In these instances, the Democrats early-voted those GOP votes. In the ten battleground states there were six million complaints from Election Day-only-Republican-voters that they were denied the right to vote because, they were told, they had early voted in 2012 when in fact they had not. Democrats, they complained, had stolen their Mitt Romney votes for Obama. Vote fraud is the most serious crime any government can perpetuate against its citizens, and there is no prison sentence long enough to repay a people for the representation they lost. In the final analysis,the Black Americans who realize they were double-shafted by Obama need to take a poll of the Black community to find out how many of them actually voted for Obama in 2012 (since by that date, they had a pretty good idea the guy in the White House was not on their side). I'd bet even money that most of them have been wondering who—besides bankers and Watermelons (communist environmentalists who are green on the outside and red on the inside)—voted for Obama. With a large percentage of the Black community (around 45% out of work, I don't think too many of Black families still believe the 2008 lie "you help me and I will help you." I expect there are about 219 Democrats in the House and Senate who voted to destroy America's healthcare system by letting Obama ruin it; and worse, giving 15 bureaucrats in Washington the right to sentence your parents and grandparents to death by denying them lifesaving medical procedures solely to curb the number of Social Security and welfare recipients who are draining the already bankrupt Social Security fund which will collapse the economy sometime between 2020 and 2040. Yup, when you look at it, I guess Mark Carter, who directed his words to Obama, said it best. His words should go down in history. "Mr. President, we'd probably be better off if you cut your presidency off right now. Just quit. Because if this is what you call helping us, then just stop helping us." Mark, I'm sorry to have to say this, but Mr. Obama really never had any intention of helping anyone except himself and, of course, his benefactor, George Soros. But, for what's it's worth, Mark, you're da man!